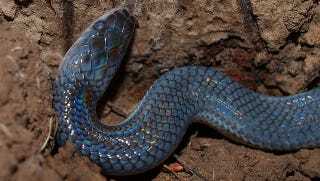 Of all the iridescent snakes in the world, the rainbow boa is the most famous, but the sunbeam snake, which we see above, is the most spectacular. The shimmer that they have comes from special structures called iridophores. Most of the time, you’ll see references to iridophores when reading about squids and other famous color-changers. For these animals, iridophores lie under the skin, under the chromatophores which control pigment, and are dynamic cells that are under the conscious control of the squid. Iridophores on snakes are very different. They are the top of the scales, a kind of gloss over the layer of melanin which gives the snake its dominant color. These iridophores don’t move. They consist of layers of tiny crystal-like cells which lie on top of each other. Light gets refracted between the layers. Different light waves interfere with each other, heightening peaks through constructive interference or flattening them through destructive interference. When you look at the snake you see different colors which shift depending on the angle from which you view them. The mechanics are similar to that of a soap bubble. Top Image: Bochr. Second Image: Angela Rothermann. Third Image: Rivanenkova M.L..